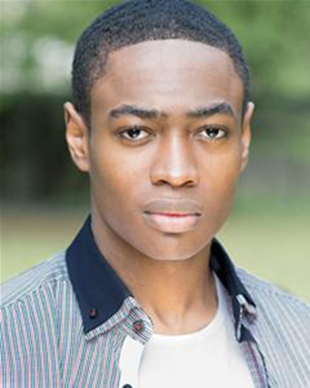 Gamba Cole arrived on the London theatre scene last year, giving a stunning performance in Kingston 14. 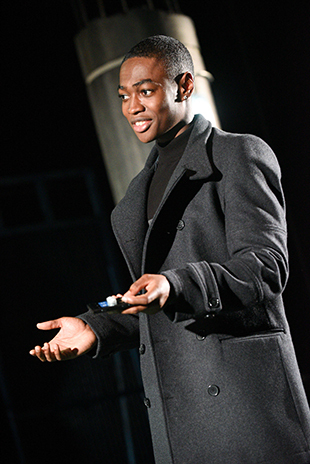 In his second play by Roy Williams, the Peckham native is currently playing Eamon in Antigone. 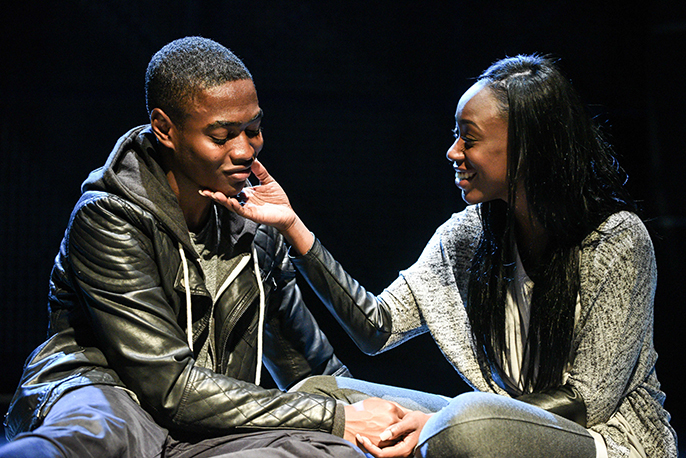 Preparing for a run at Theatre Royal Stratford East after a national tour, Cole is delighted to be back in Stratford. Despite being only 22, Cole’s journey to the stage has already been “very hazy" and the actor is clearly elated with his role. Aside from his humble gratitude, what is striking about Cole is his almost superhero far sightedness. The Identity Drama School graduate has a strong desire to give back and to inspire other young people to pursue their goals. As we discuss the play, working with Roy Williams and Cole having previously played Antigone himself, it seems Cole is already giving some shape to the next generation of theatre. Antigone is one of the classical Greek Theban plays and over 2000 years old. Has Roy Williams altered this production to appeal to a modern audience? He modernised the language more than anything. Before rehearsals he made it clear he wanted to stay true to the script. He didn’t want to alter the plot because he loves the original play so much but he wanted to make it more current. The themes of what goes on in the classic piece are still relatable and still go on in today’s society so nothing’s really changed; it’s just the time and the way we speak. I would say he’s given my character Eamon’s mother Eunice more of a voice and a dimension in the play. It’s an interesting way of showing how a mother stands by her husband and the influence that she has on the piece. It’s good to see strong women making decisions as well, not just following the man. That stands for Antigone, but for Eunice as well. She’s just as much to blame as her husband, Creo. It’s interesting to see how much of an effect she has. Roy Williams made it clear he wanted to stay true to the script. He didn’t want to alter the plot because he loves the original play so much. How do you perceive your character, Eamon? For me I feel like he’s been brought up in a sheltered atmosphere, so his parents have imposed a lot on him and he hasn’t developed the courage to know what he desires in life. He’s always known that there’s more to life than ruling Thebes. He wasn’t initially brought up to be the heir, but since his brother was killed he got fast-tracked into that dimension which is something he wasn’t ready for. So there’s a lot of pressure on him to emulate his father. But his mentality is that he doesn’t agree with the way things are but he’s unable to voice his opinion. It takes his situation with Antigone to decide what man he wants to be. I feel like it’s relatable. There will be many people who have found themselves in a similar situation. It’s not like you don’t love your parents, it’s just that you find you have a different way of thinking and it’s hard to voice that and be independent. What was your own family’s response to your decision to be an actor? Initially, it wasn’t exactly negative but it was like ‘You’ve got to think of other aspects. What’s plan B?’ So initially it wasn’t 100 per cent supportive. It was just my mum and having two brothers and five sisters around, I didn’t have that freedom to chase my dreams initially. I had to make sure I got a job so I could contribute to the household. It wasn’t until last year with Kingston 14 when a lot of people started to believe ‘Ok, he’s serious about this.’ You know how teenagers have phases? Well I grew up playing football and it was being said that I was gonna be a footballer. But although I loved it, it wasn’t what I wanted to do. It’s not the feeling I get when I’m on stage. When I’m on stage it’s a feeling I can’t even describe. I always knew it was where I wanted to be. It was like my body was there but my mind wasn’t. Now I’m doing what I love. I’m waking up with a purpose and am always trying to find opportunities. I love sharing that as well, that sharing of finding things that you love with other young people. Don’t give in; go in search of something that you love. I’m not anywhere near where I’d like to be, but I know I’m on my way and am going to enjoy that journey. I started in secondary school. I did a BTec First Diploma and got a distinction which I didn’t expect to be honest with you. When I was picking my options so many of the choices seemed theory based and I’m a practical person. So I thought ‘I’m gonna take performing arts and see what it’s like. But when I started learning it was like it had been there waiting for me. So I went to college and did a National Diploma for two years and got a distinction in that as well and from there I knew I wanted to purse acting. I knew that I didn’t want to go to university. It’s not that I’m not a fan of education; I just felt I’d had enough of it and that I needed to learn from life now. I felt that the way I was schooled didn’t excite me about learning, it was just ‘Here’s your book, we’re gonna teach you so you can pass your exam.’ It wasn’t about enjoying learning. For a while I wasn’t acting ’cos I had to get a job and stuff. It wasn’t until I was in Gone Too Far that things actually started to turn for me and that’s when Kingston 14 came around. I got a lot of exposure from that and was working with some fantastic people and they all helped me grow. Now I’ve come into this and I’m growing again but my journey has been very hazy; up and down and in and out. Now it seems to be steadying but my journey is ongoing. It seems like it’s been a long journey actually, but I’ve only been a professional actor for the last year. You played young gang member, Adrian in Kingston 14. What sort of research did you do for this? Well, my parents are Jamaican, so the language wasn’t alien to me. But for the character in himself, for me it was easily relatable because I grew up in an area of south London and it resonated. You’re trying to fit in so you’ll do whatever to be a part of something. Because your family has broken down you’ll find your family elsewhere. Adrian’s mum is ill, his dad’s passed and he’s found people who will look after him but first he has to prove himself. I feel fortunate because I never went down that path but I know a few people who have. On the outside, gangs seems just like a group of committed friends, but underneath joining one is a cry for help. Adrian wanted a family and to feel loved and those are the qualities that go with those groups, but it’s not backed up when it counts. He went to the wrong people for that. This is your second professional theatre role and both productions have been written by Roy Williams. What do you admire about Williams as a playwright? I think he’s fantastic. Whether he’s rewriting a play or writing one of his own, the characters are so real. They go through situations that when you watch in the theatre you go ‘Wow. Thank goodness that’s not my life.’ He’s just so real and he’s a great person as well. Very approachable; you can talk to him about things you don’t understand and he’s ready to help. I’m lucky to have my first two plays not only done at the Theatre Royal Stratford East, but to be written by him. Antigone is a drama but is funny in parts and it’s got loads of different elements to it. I think it’s a play that can be enjoyed by everybody. During your studies did you do much classical theatre? Yeah, during my studies we did Antigone. We did the first scene from the play but they changed Esme and Antigone to brothers. So I was paying the male version of Antigone. (Laughs.) That was more for learning about scripting and working with the text. We also did several Shakespeare plays and other classics. Do you think classical theatre or Greek tragedy has the power to attract a younger audience? Yes, but it depends how it’s publicised and how it’s been put forth. Young people, we’re happy to do most things even though we may complain. It’s just way it’s put across to us. It has to intrigue us because we’re very much of a digital age. The formatting of it I think is crucial. In this play we have so many digital aspects like projection and a live camera stream. Things like that can intrigue young people to think ‘Wow, that’s theatre that’s for me.’ That’s one of the reasons I wanted to take on the role because of Marcus (Romer - director) and Pilot Theatre Company because they want to work with young people and make it appealing for them. I don’t think if we were in robes and sandals it would be anywhere near as appealing. We had a lot of school groups come and see the play and afterwards they were like ‘Wow. That is not what we expected.’ They didn’t know that a Greek play could relate so well to their own lives and it’s great to be a part of that. Being so early on in your career, do you have any aspirations or things you’d like to achieve in the next ten years? This is something I’ve thought about. I feel like with the industry in the UK, the roles aren’t being equally dispersed. That’s the reasons why a lot of actors go to America because they have better budgets to finance their careers. In the UK, I think the roles people are getting as ethnic minorities are still stereotypical. There’s still a lack of roles for someone of ethnic origin just playing an average Joe. So I’d love to be in a position that I can create stuff that’s ethnically diverse but not just playing to the stereotypes. I’ve also always wanted to set up a youth club. The difficulty with that is finding a location. Because I want people from any area of London to feel they can come to it. For example, if it was in south London I wouldn’t want people from north London to think ‘Oh, I can’t go there cos it’s out of my area, different people and so problems may occur.’ So finding somewhere where there’s mutual turf. Not just for drama but for other creative things. I’ve met a lot of people where people like to draw or paint but getting into that can be difficult, so just providing a creative outlet is something I’d like to do. Why should people come and see Antigone? It’s a great play. With a great cast, a great writer and a great director. It’s a drama but is funny in parts and it’s got loads of different elements to it. I think it’s a play that can be enjoyed by everybody.